Welcome to August and (knock on wood!) a bit of summer once more! With the sun shining brightly, we’ll have to remember to check on the greenhouse to ensure the plants are being watered sufficiently. If you have signed up for the Operations Subcommittee, now’s your time to shine! Sign up for the watering schedule so we can take advantage of the sunshine and kickstart our new plants. On a more serious note, please ensure that both the front and back doors are closed and locked securely once you leave the greenhouse. If you are having trouble getting the doors to lock, please speak to a board member or let us know via email as soon as possible. As there has been slower growth with our lettuce crops, we will not be holding today’s supplementary greens harvest. We apologize for the inconvenience, but will see you on Monday, August 10 for our regularly scheduled work party/harvest. Yesterday, we chatted with APTN’s Kent Driscoll about growing food in Iqaluit. Keep an eye on APTN News in the coming days for his report! 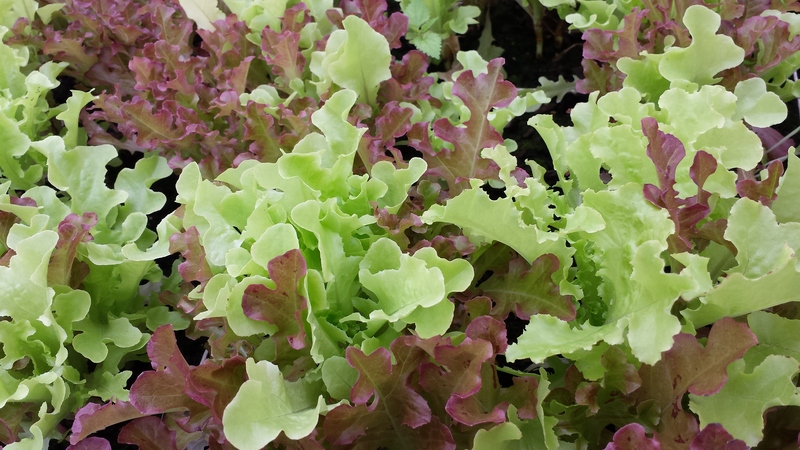 With a bit more water and sunshine, our lettuce crops will be ready for another harvest!